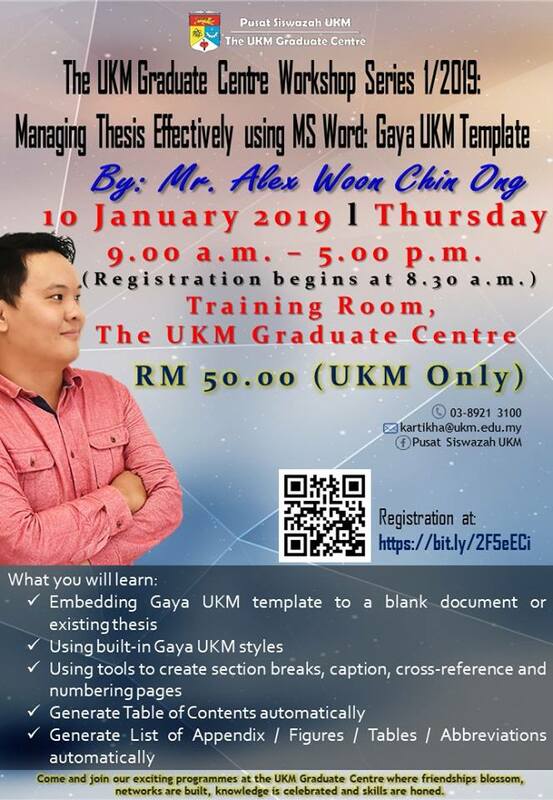 The UKM Graduate Centre is pleased to invite you to join The UKM Graduate Centre Workshop Series 1/2019: Managing Thesis Effectively using MS Word: Gaya UKM Template. ⏰ 9.00 a.m. – 5.00 p.m. Please feel free to contact us for any enquiries. You may contact Miss Kartikha at kartikha[at]ukm.edu.my or call 03-8921 3100. Come and join our programmes at the UKM Graduate Centre where friendships blossom, networks are built, knowledge is celebrated and skills are honed.